For centuries, scientists have been searching for an ancient temple dedicated to a winged warrior. Now, one archaeologist thinks he may have found it. Only problem: It’s in the middle of a war zone. In an ancient stone carving, warriors brandishing shields and swords swarm over the columned facade of a grand temple. On one side, a palace stands with three women perched on top; on the other, above private homes, a ruler on a throne dictates to royal scribes. In the foreground, the peaks of northern Iraq soar. For centuries, scholars and archaeologists have speculated about the whereabouts of this near-mythical temple and the powerful city where it resided. While they know its history, the storied city’s exact location has long been lost to time, until a recent report by a local archaeologist claimed to have hit upon the temple’s remains. 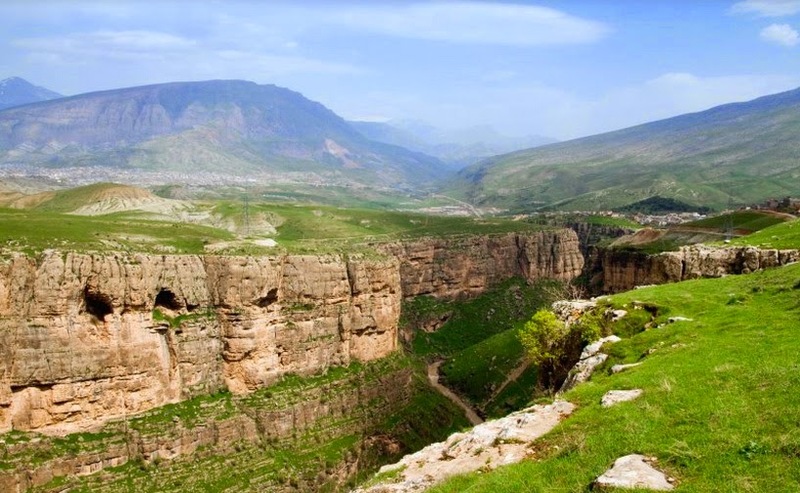 Using clues pulled from surviving records and descriptions, Dlshad Marf Zamua believes that, after seven years of research, he’s found the last traces of Musasir in what is now a village called Mdjeser in Iraqi Kurdistan. More than 2,500 years ago, the holy structure was the shining glory of the ancient capital city of Musarir, also known as Ardini, in modern-day Iraqi Kurdistan. For hundreds of years, around the first millennium BC, the house of worship and its home city were renowned as holy sites. Scholars believe that the temple was built in the late ninth century BC to honor the god Haldi—a winged warrior standing on a lion—and the goddess Bagbartu in the Iron Age kingdom of Urartu, which considered Haldi its national deity. The adorned temple of Haldi was described as having multiple gates, where large numbers of animals were sacrificed. There was supposedly a courtyard, and scholars believe regional kings were crowned on its grounds, where they would later erect bronze statues in their own honor. The region was a constant battleground for political powers in the Middle East, and in 714 B.C., the armies of Sargon II of Assyria captured and plundered the holy Musasir. Within the temple, they found a cache of treasure hoarded for centuries. The crusading king’s loot totaled an estimated one ton of gold and 10 tons of silver. This was the eighth campaign for Sargo II, and one of the last major conquests led by a series of kings who would unite the Middle East under the rule of Assyria. Sargo II used claims of treachery by local rulers to justify the invasion, but it became clear that the vast wealth of the city was the real goal. He pledged the newfound riches to fund construction of “Sargon’s Fortress” the next year, with plans of making it the new center of Assyria, one of the great ancient empires. It was on the walls of Sargon II’s massive new palace that workers engraved scenes of the sacking of Masasir. In the carving, the temple is depicted with a classical pediment front and a colonnade of columns supporting the structure. If accurate, historians believe it could be the first known temple to use both those styles. For the last 40 years, since they were unearthed during a military upheaval, local villagers in Mdjeser have been using these column bases in their homes and buildings, incorporating them into stairs, seats, or courtyard additions. Marf Zamua, who teaches at Salahaddin University in Erbil, the capital of Iraqi Kurdistan, and is working on his PhD in Assyriology in the Netherlands, began collecting these recently exposed pieces. The 17 column fragments he’s found so far have led him to believe he’s discovered the long-lost temple. Along with these major finds are a collection of relics, seven stone statues, pottery, and a bronze depiction of a wild goat found in the area. He also made a connection between architectural similarities between the modern village and the ancient city—idiosyncrasies in building styles that are uncommon elsewhere in the region, like the lack of outer compound walls and stacked houses. These findings were presented in June at the International Congress on the Archaeology of the Ancient Near East in Basel, Switzerland. Paul Zimansky, a professor of archaeology and ancient history at Stony Brook University, says the general area has been thought to contain the mythic temple for many years. And while he's not yet convinced of the temple's discovery, he says the bases found "may well belong to some sort of public building of the appropriate time." He calls Marf Zamua's discoveries "a major contribution to the archaeology of this valley." "I hope he can continue his work in spite of all the political turmoil," Zimansky says. "The remoteness of the area has been both its curse and its blessing throughout history." Uncovering these treasures in Iraq has posed a special set of challenges for excavators. The area saw the suspension of digs after the 1981 Gulf War, Marf Zamua says, when the Iranian and Iraqi armies sowed the earth with thousands of landmines. Later, Kurdish fighters clashed with Iran and Turkey, and Iraqi leader Saddam Hussein destroyed thousands of Kurdish villages, including Mdjeser. As it goes, history is bound to repeat itself. Just as Sargon II plundered Urartu to fund his war chest, antiquities across Syria and Iraq have been bombed flat and looted by rebels and government forces alike. In Iraq, invading militants of the Islamic State of Iraq and al Sham have torn through Mosul’s museum and are destroying ancient treasures at an alarming rate. But there’s no telling whether the remnants of a mythic temple built to honor a winged man on a lion’s back will survive its resurrection. “They destroy anything they do not like,” Marf Zamua says of the modern-day invaders.